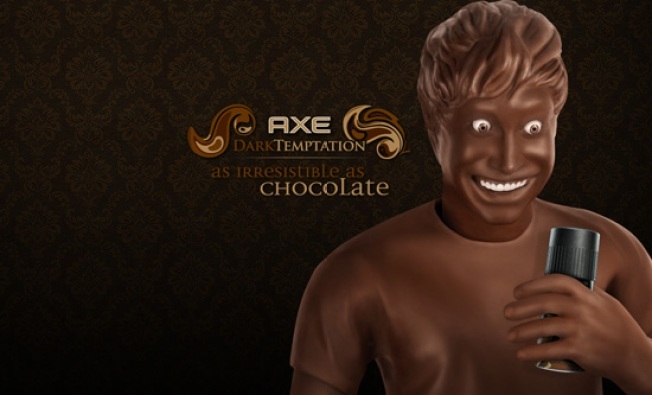 AXE Dark Temptation is a deodorant body spray and shower gel that smells like chocolate. There's a cottage industry in businesses creating products trying to answer that one elemental question -- what do women want? It sparked a Mel Gibson/Helen Huntchick flick a few years ago. Burger King is banking that a lot of women love men that smell like charred meat, hence its release of a burger-scented body spray for men. But what about chocolate? It's been scientifically proven that some of the ingredients in chocolate triggers pleasure receptors in a woman's brain (or something like that), but does that translate to the same desire for a man who only smells like chocolate? The folks at AXE are betting on that connection. The brand, known for its sexually-charged campaigns, is presently pimping AXE Dark Temptation, a deodorant body spray and shower gel that smells like chocolate. Never mind that this is the same company (Unilever) responsible for those female-empowering Dove ads. Apparently, what women really want is a man who smells good enough to eat. More information at Daily Candy.